Thank you everyone for the 100+ submissions! All submissions will be shown during the performance! Pictures from an Exhibition - A Remembrance of Viktor Hartmannis a famous suite in ten movements composed by Modest Mussorgsky in 1874 originally for piano. Ravel's orchestral arrangement of this piece is the most performed and recorded. Utah Valley Symphony will be performing Pictures at an Exhibition on October 19 & 20, 2011 in the Covey Center for the Arts in Provo. We will display submitted artwork in a slide show format while the movement is being performed. The Gnome - "A sketch depicting a little gnome, clumsily running with crooked legs." The Old Castle - "A medieval castle before which a troubadour sings a song." "An avenue in the garden of the Tuileries, with a swarm of children and nurses." Cattle - "A Polish cart on enormous wheels, drawn by oxen." Samuel Goldberg and Schmuyle - "Two Jews: Rich and Poor"
The Market at Limoges - "French women quarreling violently in the market." 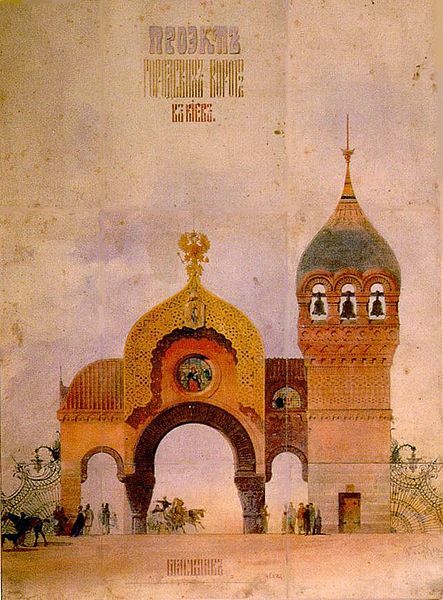 Some of the original artwork that inspired Mussorgsky can be found here. Artists must be age 25 or younger residing in Utah Valley or outlying rural areas. College students attending any Utah Valley college/university are eligible. Elementary and Secondary students living within Utah Valley (or outlying rural areas) are eligible. Some movements are less than 2 minutes while the longest movement is almost 7 minutes. Depending on the amount of submissions, there is a chance that some artwork may not be displayed during the performance and slide show. Artwork in the slide show will be timed according to the music. We suggest that you listen to the entire piece to determine what movement you would like to depict. We want you to show us what you hear within the movement - either a certain section, or as an overall theme for that movement. Comp tickets are not available. Use "StudentArtist" as a discount code when purchasing tickets ($6). If digitizing your artwork requires something other than a scanner, here are some guidelines for photographing your artwork. Download this PDF flyer to print and post in your favorite location.